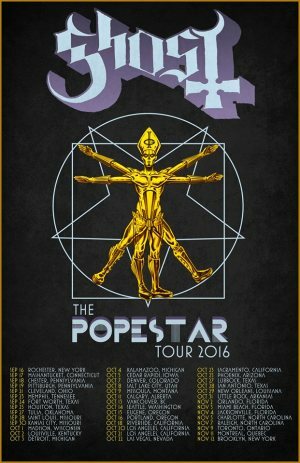 This year’s Grammy and Golden God Awards winners, Swedish rockers Ghost, have just announced that this fall they are touring North America. Check out the full list of headlining tour dates below. To other Ghost’ news, the band had to cancel their scheduled appearances on Pinkpop and Download Festival, as frontman Papa Emeritus III has been sick over the past few days and could barely sing at Download Paris last Friday. Doctors recommend the vocalist to rest and save his voice for a while. The rockers hope to be back on stage by their upcoming show in Olso, on June 15. Two days ago, on June 13, Ghost took home the Best International Band award at Metal Hammer’s Golden God Awards. Now they’ve officially got the best possible music awards on both sides of the Atlantic. The Swedes are also intending to release an EP this fall, so stay tuned for more news from Ghost. The tour kicks off in Rochester, NY on September 16 and runs all the way into mid-November. Tickets for the tour will go on sale Friday, June 17.